All the latest news on current and past research into food thawing and tempering from the Food Refrigeration & Process Engineering Research Centre (FRPERC). Thawing is the process of taking a frozen product from frozen to a temperature (usually above 0°C) where there is no residual ice, i.e. “defrosting”. Thawing is often considered as simply the reversal of the freezing process. However, inherent in thawing is a major problem that does not occur in the freezing operation. The majority of the bacteria that cause spoilage or food poisoning are found on the surfaces of many foods. During the freezing operation, surface temperatures are reduced rapidly and bacterial multiplication is severely limited, with bacteria becoming completely dormant below -10°C. In the thawing operation these same surface areas are the first to rise in temperature and bacterial multiplication can recommence. On large objects subjected to long uncontrolled thawing cycles, surface spoilage can occur before the centre regions have fully thawed. Most thawing systems supply heat to the surface and then rely on conduction to transfer that heat into the centre of the food. A few use electro magnetic radiation to generate heat within the food. In selecting a thawing system for industrial use, a balance must be struck between thawing time, appearance end microbiological condition of product, processing problems such as effluent disposal and the capital and operating costs of the respective systems. Of these factors, thawing time is the principal criterion that governs selection of the system. Appearance, microbiological condition and weight loss are important if the material is to be retailed in the thawed condition but are less important if the food is to be used for further processing. Thawing has received much less attention in the scientific literature than either chilling or freezing. Unfortunately often when it has been studied it has been in the context of domestic thawing practices rather than commercial practice. 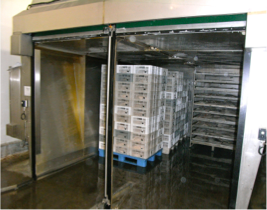 In commercial practice it is our experience that there are relatively few well controlled thawing systems in the food industry. Tempering is the process of taking a product to a temperature where a substantial amount of the water in the product is in the form of ice but not all the water has turned to ice. This temperature must be below the freezing point and is usually between -5 to -2°C. At this state the product is rigid, but not hard and thus easier to cut. The product can either be cooled to this state from a temperature above the freezing point or warmed from a frozen temperature. Unless tempering is controlled well, product variability is liable to be high. Quite small differences in temperature during processing operations such as pre-breaking or cutting can have quite large effects on product quality. The consequences of processing below the zone of optimum temper (under-tempering) may be blade breakage and yield loss from shattered product, excessive fines, and slices of non-uniform thickness. The consequences of over-tempering may also be in the form of yield loss from ragged edges and incomplete shearing of tissue resulting in pearling. Find out more about thawing and tempering in our publications, articles and links below. A full list of our publications on thawing and tempering topics can be found here. For more about our past work on this topic please read our research review on thawing and tempering. What is a frozen food? - Chris James looks at the question of what defines a frozen food. Frozen Meat - Steve and Chris James discuss the history of frozen meat.